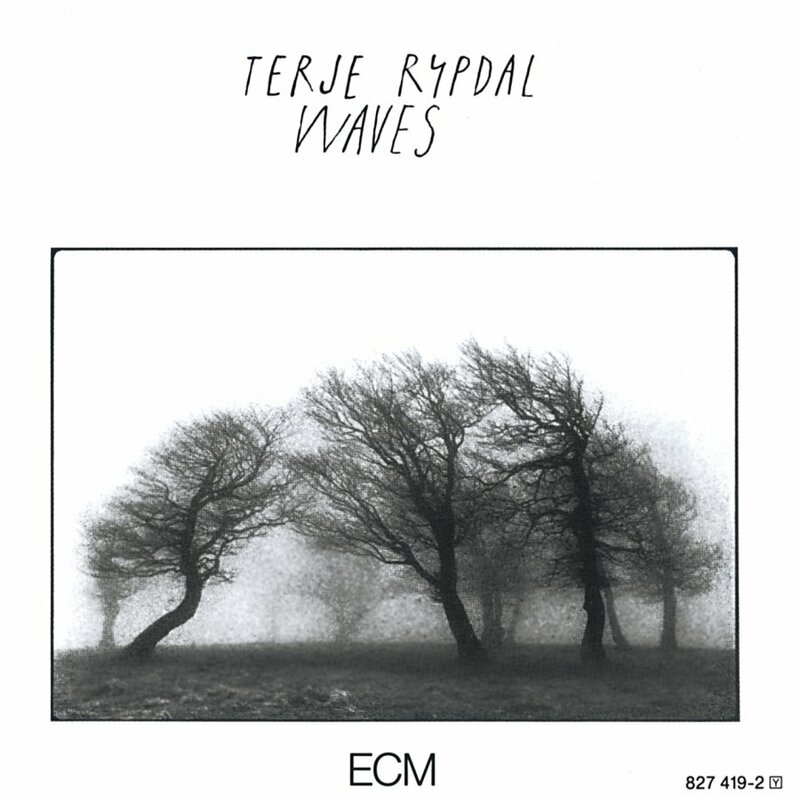 One is often tempted to appreciate Terje Rypdal through the lens of some icy Nordic mystique that, while certainly supported by the sleeves that adorn his music, may ultimately be a myth. Either way, there is something to be said for the biting winds that blow through his sonic landscapes. I would like to present Waves, however, as a corrective to this assumption, for it emanates nothing but heat. Much of that heat comes courtesy of trumpeter Palle Mikkelborg, whose legendary reputation bears auditory bounty throughout. Much of the album’s blurry spirit takes bodily form in “Per Ulv.” Combining a delightfully dated drum machine and quasi-Afrobeat percussion from Jon Christensen with the mellifluous bass of Sveinung Hovensjø, it opens itself to Rypdal’s searing flights. Mikkelborg’s quick fingers fuel the fire, which calms to a smolder in “Karusell,” where he marks his territory with breath rather than exaltation, trading off guttural statements with Rypdal’s softened twang. Mikkelborg even contributes a composition of his own in “Stenskoven,” a raunchy carnivalesque that might as well have switched titles with its predecessor. The title piece depends from lines of cymbals and snare and is supported by organ. Over this synthesized bliss, Rypdal and his cohorts weave a loose and lyrical song. “The Dain Curse” takes a tripartite structure. A clean bass line and flanged chording from guitar waft around the muted horn of a distant horizon, only to be cracked by Christensen like an egg of rock that oozes yolky guitar solos before being poached into stillness. “Charisma” reprises the organic river of “Waves,” into which Rypdal trails his fingers, leaving ephemeral shapes on the water’s surface. Cymbals drop like seeds, only to be washed away in the current, their potential life leaving like ghosts via the haunted trumpet. If we imagine the cover photograph as having any bearing on what lies within, then the music is neither the trees nor the mist that envelops them. Rather, it is the sun that blinds us to both throughout the album’s gradual evaporation. I still love this album. I’d call that drum machine beat on “Per Ulv” bossa nova, or at least a close approximation of what one of the “Brazilian” presets on my dad’s Hammond organ sounded like. Maybe that’s why I love this record so much. Even though my dad had an organ with a drum machine he hated it. I actually liked the sound of those old analog drum machines, and would noodle with it for long periods of time. The playing, feeling and result on this record is stellar. It holds up well 30 years on. Kudos all the way around. One of my favourites. i must disagree with the cover/content description. It’s all frozen landscapes to me, beautifully coloured by musician’s warmth. Like a tent in the wilderness. saludos from patagonia argentina. ‘Per Ulv’ sucked me into this album – great bass, the swell as the tempo escalates into the ‘chorus’, the synthesizer wash, Mikkelborg’s and Rypdal’s pyrotechnics – this was, to me, the epitome of European sophistication at the time (I discovered this in 1980), and I still draw inspiration from it. I have only recently discovered the existence of a ‘Per Ulv’ fan club (Rypdal and Christensen are the only members) and would love to join – ha ha. The command of dynamics and atmospherics displayed by all musicians makes this album one of the best in Rypdal’s repertoire – a logical precurser to the later ‘Descendre’. There is little to be added after your excellent review and the relevant comments by Art Simon, Storm and Ian Davis. Anyway, I would like to mention that I have always found “Stenskoven” a fascinating song. Of course you are right when you say it sounds like a carousel. The spirit is of an old circus; the piano belongs to a Western saloon. I also think there is a strong Genesis influence on this track. I hear reminiscences of “Selling England by the Pound” and actually, I am waiting for the voice of Peter Gabriel to make a theatrical entrance.